The Year of Arts, HeALIng, and Action! Photos by Scott LaJoie, UofL, Molly Jett, Josh Miller. The culmination of the Year of Arts, HeALIng, & Action! 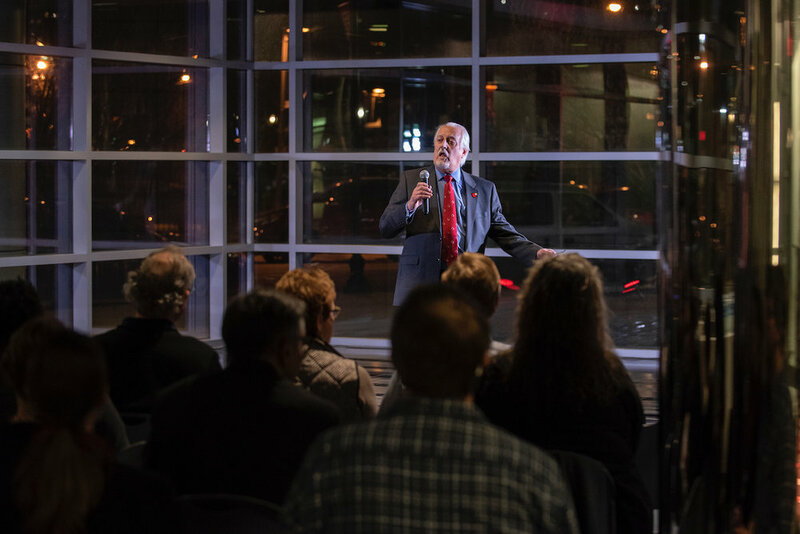 and the launch of the Center for Creative Placehealing at University of Louisville School of Public Health & Information Sciences on January 25, 2019 brought together dynamic artistic performances including the Louisville Ballet and Teddy Abrams, along with lightning talks by Louisville-based organizations and Louisville Health Advisory Board members. “This is so exciting,” said UofL President Neeli Bendapudi about the launch of the Center for Creative Placehealing directed by Theo Edmonds. “For me, this is so important, because when we think about health and wellbeing - we have to take a holistic approach to healing... we have to be a community of care.” President Neeli described the historical precedent of how the arts, and culture, have played a role in healing, and the opportunity the Center created for UofL. To fully closeout the Year of Arts, HeALIng, & Action! IDEAS xLab and the Ali Center will be releasing the Guide to Greatness in Spring 2019, an arts + health neighborhood toolkit made possible with funding from Humana Foundation and the Fund for the Arts. Preliminary planning session winter 2017 at IDEAS xLab. What is the Year of Arts, HeALIng, and Action!? Provide opportunities for co-creation, customer discovery and launching the GUIDE TO GREATNESS, an art + health neighborhood toolkit being developed by IDEAS xLab in partnership with the Muhammad Ali Center, with support from the Humana Foundation and Fund for the Arts. Read Insider Louisville’s story on AHA! Moments by click here! Our inaugural AHA! Moments events were held April 2018 at the Muhammad Ali Center, and in the Smoketown neighborhood, and featured lightning talks at the intersection of creativity + health by artist Briana Harlan, Trinidad Jackson of Youth Violence Prevention Research Center, artist and IDEAS xLab team member Hannah Drake on One Poem At A Time, Meyzeek Middle School student Denim Moore, Darryl Young of the Muhammad Ali Center, Tom Walton on Smoketown HOPEBOX, spoken word performances, a visual installation, and more. Our 2nd AHA! Moments event focused on mind/body health in June 2018 featuring speakers including Montre Davis of Linkin’ Bridge, former UofL basketball player Herb Henry, Carlos Rivas of ProFormance, and Val Slayton of the Louisville Health Advisory Board - who shared their stories from inside the boxing ring at Louisville’s Top Knotch Boxing Gym. Organized by the Louisville Sports Commission, this AHA! Moments event also featured an interactive demonstration by David Thurmond of Dance with Your Team in Mind. As the culmination of WFPL and IDEAS xLab's collaborative Tough and Universal: Stories of Grit podcast series, the Tough and Universal: Identity Lens event was held November 15 at the Louisville Public Media studio on 4th Street. The focus on Identity was explored through an in-person interview conducted by WFPL's Erica Peterson, followed by arts and culture provocations curated by IDEAS xLab, and a facilitated discussion, looking at the intersection of health and economic vibrancy through the lens of identity. The event is part of the Year of Arts, HeALIng, and Action! (AHA! Moments), an initiative of the Louisville Health Advisory Board, IDEAS xLab, and the Muhammad Ali Center. Mind/Body Workgroup during planning meeting at the Muhammad Ali Center. — - Donald Lassere, President and CEO of the Muhammad Ali Center. Support for the GUIDE TO GREATNESS - an art + health neighborhood toolkit being developed by IDEAS xLab in partnership with the Muhammad Ali Center - provided by the Humana Foundation and Fund for the Arts. At IDEAS xLab - we leverage the power of arts, culture, and the creative industries to support health and wellbeing innovation. Through drumming circles, poetry slams, visual art exercises, and writing workshops - we’ve seen communities – both urban and rural – come together to drive positive health outcomes. Whether it’s an urban neighborhood advocating for policy change, middle-school students focused on environmental justice solutions, or community residents partnering with a federally qualified health center to leverage art for space beautification and to decrease medical mistrust – approaches grounded in culture, and fueled by the arts, can support a community as it celebrates its identity and designs solutions with lasting health impact. Launched in 2015 by Humana, Inc, the Louisville Health Advisory Board (LHAB) is comprised of more than 70 members including businesses, government, schools, civic and nonprofit organizations. LHAB's mission is to improve the physical, mental and social well-being of Louisville, with the goal of increasing the number of Healthy Days – your quality of life – 20 percent by 2020 and beyond. Having more Healthy Days means things like spending quality time with family, exploring the outdoors, working jobs that challenge and fulfill us and opportunities to learn new skills. Click here to learn more.